George Ferry was an outstanding clubman, and a popular defender for the Blues during one of the bleakest periods in Carlton’s history. Despite his relative lack of height, he was durable, courageous and committed in every game he played, and brought him a reputation as one of the finest full-backs of his generation. 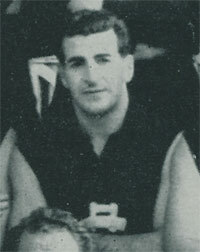 After arriving at Carlton from St Patrick’s, East Melbourne in 1949, Ferry served his football apprenticeship as a member of the 1948 and 1949 Under-19 Premiership teams (as well as the 1951 Reserves Premiership team) before he was called into the Blues’ senior side in 1952. Carlton made the finals in fourth place that year, but lost to Fitzroy by one point in the first Semi Final. That was a portent of what was to come for both George and his team. In the following decade, Carlton played in just three more finals matches – and lost each of them. Yet throughout these tough times, Ferry matched - and regularly beat - the best full-forwards in the game. He developed a great understanding with champion back pocket Bruce ‘Bugsy’ Comben, and the pair’s strategies at kick-ins often saw one of them mark unattended. They got away with it for years, too, until Melbourne’s Norm Smith eventually worked out how to match them up. Ferry wore his navy blue guernsey number 25 on 139 occasions from 1952 to 1961, and was whole-hearted in every one of them. Blues supporters respected his resolute efforts week after week, and gave generously when Carlton honoured him with a testimonial year in 1962. Afterward, George was a long-serving, top rating Melbourne radio football commentator, and a familiar face at Carlton club functions for many years. He passed away, aged 73, on February 6, 2005. Contributors to this page: molsey , PatsFitztrick , Bombasheldon , tmd1 , true_blue24 , WillowBlue , pblue , p(12)terg , Jarusa and admin . Page last modified on Wednesday 03 of April, 2019 10:22:30 AEDT by molsey.